amiQure Derma is excellent for restoring and maintaining the skin and coat of your dog, to maintain optimal condition. 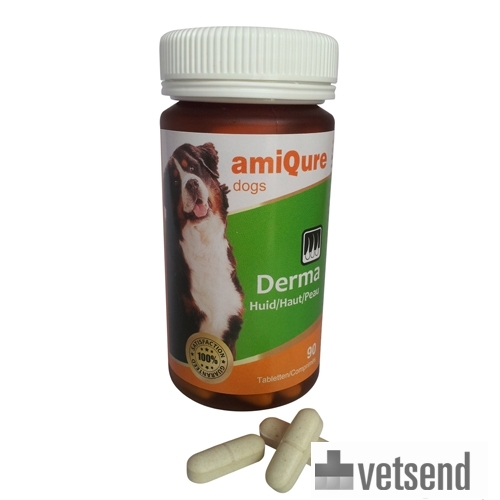 amiQure Derma for dogs is a food supplement made from high quality natural ingredients that are effective for keeping dogs' coat and skin in optimal condition. It contains a high level of biotin, in combination with zinc and omega-3 and 6 fatty acids. In practice, amiQure Derma has proven to be an excellent and animal-friendly alternative to some synthetic drugs. As with other amiQure products, the Derma formula is comprised of a Multi-Action system, tackling the problem in several ways. 1 tablet per 10 kg of body weight, given daily. Biotin, vitamin A, zinc, vitamin B3, fish oil, starflower oil, garlic extract, vitamin E.
Have you used amiQure Derma before? Let us know what you think about this product.